This morning Patriarch Maxim (Minkov) of Sofia led services in Sofia's Cathedral of St. Alexander of the Neva to celebrate the new style feast of Sts. 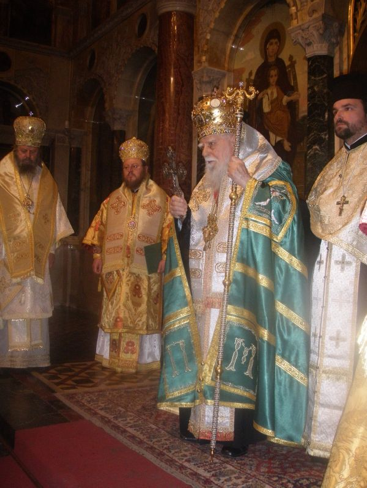 Cyril and Methodius and the 58th anniversary of the restoration of the patriarchate of the Bulgarian Orthodox Church. The festal services was concelebrated by Metropolitan Neofit (Dimitrov) of Ruse and the patriarchal auxiliary bishops. More (in Bulgarian) here.